The Dr. M. Wosk Environmental Leadership Award was established by the Pacific Parklands Foundation for the development of youth leadership in 2006. The leadership fund is used to engage, train and empower today’s youth with the skills necessary for the future sustainability of our spectacular city and regional parks. Participants will have training in ecological issues and environmental preservation as well as the organizational and communication skills necessary to make a profound difference. The impact of their work will be felt by all as they grow to become the leaders of the future. 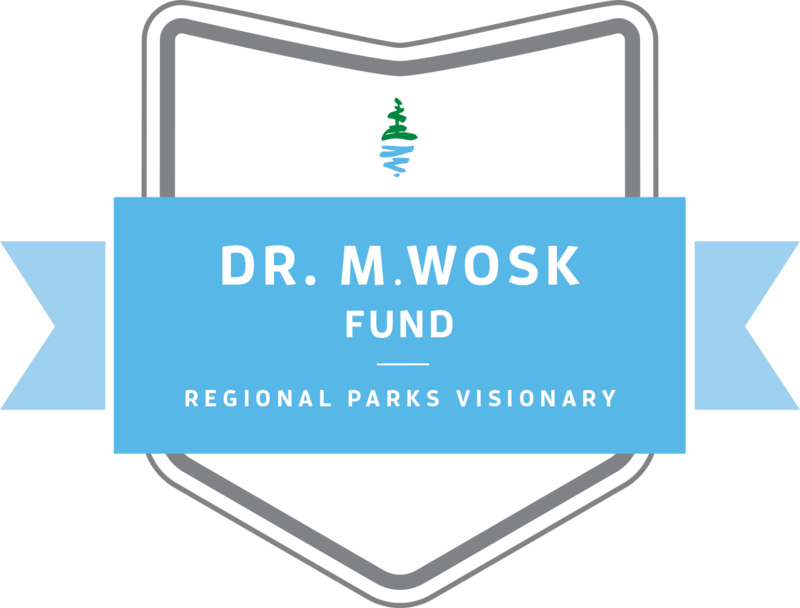 The Dr. M. Wosk awards are open to students and individuals in the Metro Vancouver regional parks area. The value of each award ranges from $250 to $1,000 annually. All applications and nominations are reviewed by the Foundation’s Environmental Leadership Selection Committee and they determine the number of recipients and the value of each of the awards presented annually. George Ross loved trees and walking along the forested trails of our regional parks. He lived for many years in Burnaby and treasured his time outdoors. He wanted to express his deep love for our regional parks by leaving a gift in his will. George was a true visionary for our parks. When George Ross passed away, he left an extraordinary legacy for future generations. George’s $2.8 million bequest in his will is a gift that will just keep on giving for many years to come. endow the George Ross Legacy Stewardship Program, administered by Pacific Parklands Foundation. The annual interest from this endowment – $50,000 to $60,000 a year – funds hands-on stewardship activities by our park partners and provides opportunities for citizen stewardship. “George Ross’s generous bequest is allowing our Foundation to leverage funds from the generated interest for years to come to create lasting projects and initiatives in the regional parks system,” said David Pohl, President of Pacific Parklands Foundation. Gordon Smith was dedicated to serving people and the environment and was one of the finest people many of us ever met. He was passionate about stream and wetland stewardship and very active in conservation projects in Aldergrove and Delta. To inspire others to follow his path, his friends and colleagues have initiated the “Gordon Smith Youth Environmental Stewardship Award”. This endowment fund provides an annual bursary to a student for his/her contribution to conservation in the region. To continue Gordon’s legacy, a group of his colleagues and friends came together after his death to create the Gordon Smith Environmental Youth Endowment Fund. Supported by Metro Vancouver Regional Parks, the Parks Partnership and private donors the fund is administered through the Pacific Parklands Foundation. The fund allows a modest bursary in Gordon’s name to be awarded each year at the annual Metro Vancouver Regional Parks’ Celebrating Partnerships event which is normally held in March. The award is open to any youth in the Region who has shown a passion for involvement in the environment and who intends to pursue post-secondary education in an environmental field. Those of us who knew Gordon or had the opportunity to work with him are content in the knowledge that he would be pleased to see his passion and inspiration being passed on to the youth of the Region through this award. May 15, 2007 was a special day for the Foundation when it received a significant land and cash donation as a result of an arrangement between the Township of Langley, the Martini Family, Pacific Parklands Foundation and Metro Vancouver Regional Parks. The donation included a 23-acre parcel of land in Langley and a cash donation – gifted unconditionally to the Foundation. The land was appraised in 2007 at a value of $691,500. This was an exemplary transaction with many parties – local and regional government, private citizens and a private foundation – all working together for the long term benefit of the community. The land is located on the southwest edge of Derby Reach Regional Park and is part of an extremely valuable wetland complex. The donation to the Foundation meant that the wildlife inhabiting this environmentally important area would be preserved, and that one day visitors would be able to experience this unique place. The Pacific Parklands Foundation has entered into a long term lease agreement with Metro Vancouver which allows for the 23-acre parcel of land to form part of the Derby Reach Regional Park. A win-win for all! Some of the cash gift will be used to help support a variety of much needed regional park projects in the Township of Langley and surrounding areas. The balance of funds will support a much needed endowment that will help leverage additional funds for future regional park projects.